APM (African People Movers) offer cheap bus tickets between all the major cities in South Africa, as well as to a plethora of smaller ones - they're easy to spot - just keep an eye out for the red buses. The company is relatively new, having started offering intercity coach trips on the 12th December 2014. APM offers a service in the following provinces of South Africa: Gauteng, KwaZulu-Natal, Limpopo, Mpumalanga, North West, Northern Cape and the Western Cape. Website bookings can be made via their website (www.apmbus.co.za) - unfortunately their website is sometimes down. Or visit at 50 Delfos Road in Pretoria. Braamfontein Station, Durban Station and Pretoria Station. Whilst not exactly a special, APM are proud of retaining their fares at the same price, regardless of whether it's a peak travel time or not. APM sometimes offer accommodation specials - e.g. in June 2016 they offered a special with Zwinoni Lodge. 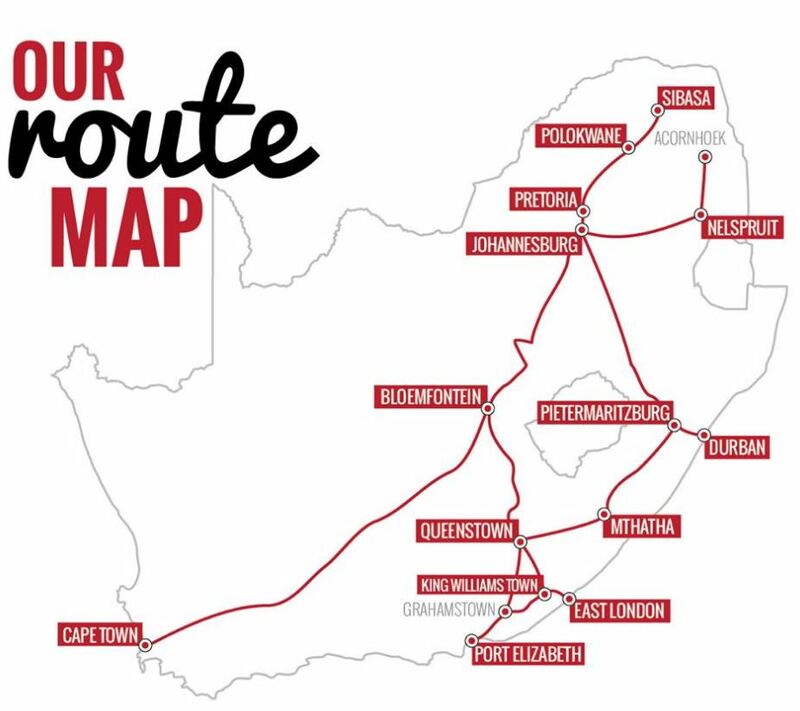 The main routes to Johannesburg are: Cape Town to Johannesburg, Sibasa to Johannesburg, Nelspruit to Johannesburg, Durban to Johannesburg, Umtata to Johannesburg, East London to Johannesburg and PE to Johannesburg. APM don't break food on board their buses, but there are plenty of stops along the routes where you can get off and buy food (just be sure to do it quickly, you don't want to be waiting for your burger to be cooked whilst the bus is leaving). See their terms and conditions for the latest up to date information. Departure: Passengers must be at the departure point at least half an hour before the departure time. If you arrive later you may not be able to board. Identification: To board an APM bus, you need a valid ticket and corresponding identification document. Note that there are additional requirements fo minor children. Children: Children younger than 3 may travel on the lap of their parent/legal guardian; free of charge. Children younger than 12 may not travel alone - they must have a legal guardian or parent with them. Children older than 12 but younger than 18 may only travel alone, if their parent/legal guardian has signed the correct indemnity form, provided an affidavit proving consent from at least one of his parents/legal guardian if travelling into or out of SA, and in the case of a legal guardian a court order proving they have legal rights. Ticket cancellation & refunds: APM bus tickets may be cancelled subject to payment of a cancellation fee (25% if cancelling within 3 hours of the departure time, or 10% otherwise) - a refund is not made, but rather a voucher is given which must be used within 3 years; and the passenger can use it when switching to an alternate date. Passengers who arrive within an hour after the departure time receive a 50% penalty, and can transfer to the next departure; whilst pasengers arriving more than an hour late, unfortunately get a 100% penalty. Tickets may be cancelled by phoning 087 820 8111 and faxing the relevant info to 087 809 5626. Hop on hop off: This is not allowed - the trip must be done in one continuous stretch. If you'd like a hop-on-hop-off option, try the Baz Bus. Luggage: The luggage allowance on APM buses is two suitcases whose total weight should not exceed 20kg (30kg for international trips) and each suitcase should have the following maximum dimensions: 80cmx60cmx30cm. Any luggage weighing more than the free allowance will be charged at the applicable rate. APM coaches do not accept any luggage at their own discretion; but in particular inter alia firearms, narcotics, animals, corpses, coffins, ammunition, hazardous/harmful chemicals, explosives or toxic substances. The following must be properly packaged: electronic equipment, sporting equipment and fluorescent signs. Alcohol & smoking: Consumption of alcohol as well as smoking is not permitted on all APM coaches. Pets: No pets are permitted on any of their buses save for trained guide dogs, for which prior notification has to be given before date of departure. APM's ownership is more than 50% black. Their intercity buses were launched by Tumisang Kgabosele and Johann Ferreira in December 2014. Operations to Port Elizabeth, are launched. Operations to Germiston Station are launched. Operations to Sibasa, Limpopo, are launched. Operations are launched in and out of Park Station in Johannesburg. On the Durban - Pretoria route, 3 full buses were run for the first time. Tickets are now available for sale at Shoprite Checkers outlets. APM's maiden voyage from Pretoria to Durban. APM begins operations. They are up against some fierce competition: Intercape, City to City, Citiliner, Translux, Greyhound, Eldo coaches, Eagle Liner and Intercity Xpress.